Read our present Daily Current Affairs Quiz - 28th May 2018 . Experience our Current Affairs Updates and in view of this we have given a rundown of 13 questions. 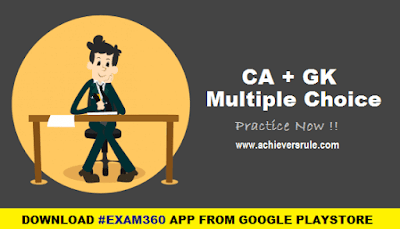 Wannabes ought to experience the Latest News Headlines before endeavoring this test as these are vital for the forthcoming government examinations of Bank like IBPS PO, IBPS CLERK, SSC CGL and SSC CHSL. These are imperative and hopefuls ought to experience these all the time. Q1. The Employees’ Provident Fund Organisation’s (EPFO) trustees had decided to cut the administrative charges to how much? The Employees’ Provident Fund Organisation’s (EPFO) trustees had decided to cut the administrative charges to 0.50 per cent from 0.65 per cent of total wage . Q2. IBy which year indigenously developed Rustom-II Unmanned Aerial Vehicle will be delivered ? Indigenously developed Rustom-II Unmanned Aerial Vehicle (UAV) by Defence Research and Development Organisation (DRDO) will be delivered to armed forces by 2022. Q3. which government announced that it would provide life insurance cover of Rs 5 lakh each to all farmers in the state? The Telangana government announced that it would provide life insurance cover of Rs 5 lakh each to all farmers in the state. Q4. who won the third Indian Premier League title? Chennai Super Kings defeated SunRisers Hyderabad to clinch their third Indian Premier League title. Q5. which team won Champions League 2018? Spanish football giants Real Madrid have claimed yet another Champions League title by beating English side Liverpool FC 3-1 in the final. Alan Bean, the fourth person to walk on the moon and the last surviving member of the Apollo 12 mission, died Saturday in Houston, according to his family and NASA. He was 86. Q7. Nasirul Mulk was the chief justice of which country? Pakistan names former Chief Justice Nasirul Mulk as caretaker PM. Q8. The Queen of which country is coming on a four days visit to India? Days after Netherlands Prime Minister visited India, the Queen Maxima of the Netherlands arrived here for a four-day visit, as per the Ministry of External Affairs. Colombia has formally joined North Atlantic Treaty Organization as global partner that makes it first Latin American to join NATO. Q10. who launched ad campaign for Swachh Bharat to promote twin pit toilet technology? Q11. The BCCI has signed agreement with which country to promote green cricket in india? The BCCI and United Nations Environment on May 27, 2018 signed an agreement to promote green' cricket in India. Q12. The first edition of the Global Wind Summit will be held at which place ? Q13. who won the Monaco Grand Prix 2018?